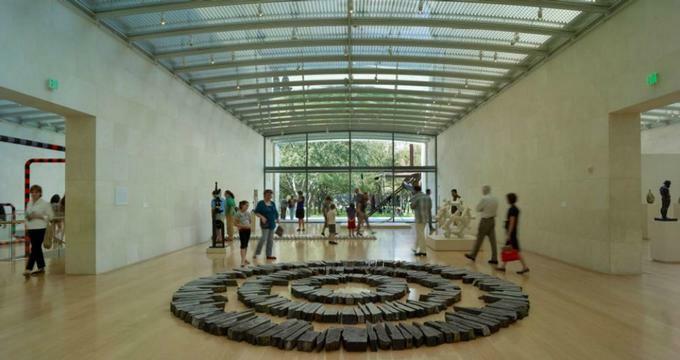 The Nasher Sculpture Center in Dallas is dedicated to exhibiting and displaying beautiful sculptures and is home to the Raymond and Patsy Nasher Collection, which has been hailed as one of the most acclaimed collections of contemporary sculptures in the world. Designed by acclaimed architect Renzo Piano and landscape architect Peter Walker, the Center is situated in the heart of the Dallas Arts District features more than 300 sculptures by master artists including Miro, Matisse, de Kooning, Rodin, Moore, Giacometti, Hepworth, Picasso, Kelly, Calder, Suvero, and Serra. The Center features luminous indoor and outdoor galleries that house the work of some of the world’s greatest artists, as well as special exhibitions throughout the year, featuring modern masters and contemporary works drawn from private collections and other museums. In addition to the beautiful indoor and outdoor spaces, the Center also has an auditorium for lectures and symposiums, education and research facilities for further learning, an onsite café that serves delicious cuisine and an award-winning store that sells one-of-a-kind gifts, jewelry, and décor. The 55,000-square-foot building was designed by acclaimed architect Renzo Piano, who also worked with landscape architect Peter Walker on the design of the magnificent two-acre garden. The building and are garden blend symbiotically with a parallel series of “archaeological” walls that create a flow between the indoor and outdoor spaces of the center. The gardens feature rows of holly hedges, oak and cedar elm allées, and stone plinths that serve as seating. The museum is split into two levels: the ground level houses three galleries, several offices and a boardroom and the award-winning gift shop, while a basement level features a gallery for delicate objects, an auditorium, conservation workshops and several service spaces. The outdoor garden terraces create and outdoor theater space that is popular with visitors. The Nasher Sculpture Center also presents a diverse array of educational and cultural programs for adults and students, including a lecture series called 360: Artists, Critics, Curators that focuses on art-world visionaries discussing sculptural themes, and a series of small-scale exhibitions and installations called Sightings that explore new work by both established and emerging sculptors. Other educational programs include Soundings: New Music at the Nasher – a critically-acclaimed new music series featuring groundbreaking performances, Scope Out Sculpture – virtual tours via a periscope where visitors get up close with the work of featured artists on 20-minute virtual tours; and Ultra-seeing Film Series - an exploration of experimental cinema. The Nasher Sculpture Center presents a unique Kids Club where children of all ages can enjoy six free exclusive events per year that include exhibitions, interactive activities, immersive programs and educational workshops. Monthly events at Nasher Sculpture Center include the family-friendly ‘Target First Saturdays’ which promise a fun and educational outing for the whole family, and ‘Til Midnight which offers alfresco dining, live music, movies and a twilight stroll. The Nasher Sculpture Center is located at 2001 Flora St, Dallas, TX 75201 and is open Tuesday through Sunday from 11:00 am until 5:00 pm. A short introductory orientation film is available for viewing in Nasher Hall during regular museum hours, and The Nasher Sculpture Center is fully ADA-compliant. Amenities at the Center include the Nasher Café by Wolfgang Puck, which serves a seasonal menu of light meals, soups, and salads that can be enjoyed overlooking the Center’s magnificent gardens. The Nasher Store is an award-winning store in the Center that sells a variety of thoughtfully designed accessories, books, art, jewelry, décor, as well as custom works by local artists featured in the Center. The Nasher Sculpture Center offers an annual international award known as the Nasher Prize that is presented to a living artist in recognition of one of his or her works that have had a significant and extraordinary impact on the understanding of the art form of sculpture. The prize includes US$100,000 and offers recognition of the winning artist and their work on an international scale.